Members should keep an eye on the postbox over the next 2 weeks or so, as the new Handbook should be arriving. If it has not arrived by the end of the month, please contact John, EI7IG. Posted in 2008, news, training | Comments Off on New Handbook published. 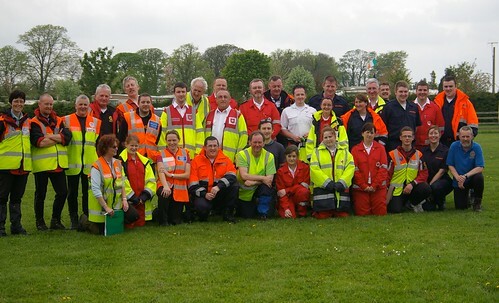 The morning of May 10th, the South Tipperary Voluntary Emergency Services group held a Emergency Services event in Clogheen, Tipperary. The main focus of the day was meet other voluntary groups, while learning from and educating other groups about AREN’s capabilities. The main events were displays and exercises (round-robins) which gave attendees an insight into each groups skills. 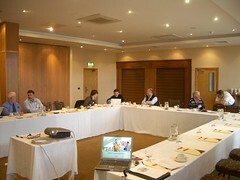 In all, over 40 voluntary members attended. Registration began at 9:30 in Clogheen. Attendees from each organisation were split-up into groups made up of other organisation members, helping the cross-organisation communications in an informal and relaxed atmosphere. The morning began with a short 5 minute introduction to each organisation, its beginnings, its members, what their capabilities are, their equipment, and where they are based. 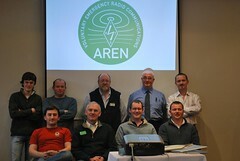 AREN member, Richie Ryan, EI9HR, gave a very interesting introduction to amateur radio and AREN operations. One member of each group then went to set-up the round-robin display for the days activities. Each round-robin took approximately 30 minutes. The events were held in the near-by Parsons Green campsite. Each round robin was run in parallel to all the others, and each group moved between them. The first event was from the Civil Defence members. From the beginning of the Civil Defence in Ireland, radiation monitoring has been the main activity of their “Warden Service”. The speakers gave a presentation of the main radiation monitoring techniques – a low-level radiation detector which measures down to normal background radiation levels and a second type of instrument would be used to detect and measure the far higher levels of radioactive fallout resulting from nuclear detonations in war. The next event was from the Red Cross. The Irish Red Cross Society (IRCS) was established by an Act of the Oireachtas on 1 August 1939. The Irish Red Cross is dedicated to the provision of Emergency and Humanitarian Relief both at home and abroad through its network of volunteers both nationally and internationally. An AED is a small, portable piece of equipment that can deliver an electric shock to a victim of cardiac arrest in order to convert the chaotic electrical current of the heart to its normal rhythm. Every attendee at the day was given the opportunity to practise using an AED and applying CPR. The instructors stressed the importance of commencing CPR as quickly as possible and the target time for defibrillation is less than 5 minutes. After the Red Cross display, everyone broke for lunch “al fresco”, out in the sunshine. 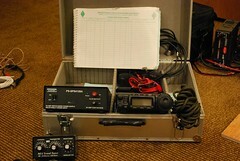 A lot of attendees had some very useful questions regarding radio operation and “what to do with them”. John had scheduled (and unscheduled) QSOs with some EI stations, including Jim Claffey EI2DDB in Dublin, and John EI2JA in Waterford, on HF by utilising the NVIS antenna setup,  and Robbie, EI2IP, who was mobile near Youghal (through the South East Repeater Network) as he was visible on the Amateur Packet Reporting System (APRS) map visible at the station while a round-robin was taking place. All-in-all attendees seemed very pleased with AREN’s presentation and made very pleasant comments at the Q&A session at the end. The final presentation was given by SEMRA. The team was formed in 1977 after an accident occurred in the mountains and a need for such a service was identified. Currently, SEMRA has about 40 members. The team operate, as their name describes, on the mountains of the South East of Ireland, the Blackstairs, Comeragh, Knockmeasdown and Galtee mountain ranges and all areas in between. The SEMRA presenters organised a search skills exercise for attendees which focused on “common sense skills”. While they maybe common sense skills, we all agreed that carrying out a search, possibly for an object as small as a set of keys on the side of a hill, is something that needs alot of skill, practice and training. After all groups had attended each round-robin exercise everyone was treated to a demonstration by SARDA, Search And Rescue Dogs Association. SARDA is a voluntary 999 / 112 emergency search and rescue organisation concerned with the training, assessment and deployment of Air Scenting Search and Rescue Dogs, to search for missing persons in the mountains, woodlands rural and urban areas including rivers, lakes and seashores, as well as avalanches and demolished buildings. After 15 minutes and a number of embarrasing “false positives”, Mick Grant and his search dog, Bono, arrived to the “search area”. Within, 3-4 minutes Bono and Mick had found the missing object, a member of SEMRA (wearing camouflage) laying in long grass. They certainly put the rest of us to shame! After the SARDA demonstration, to close the day we had the final “team-building” event – penalty shoot-out. After a very tense, nerve-racking shoot-out, as always, the best team won – AREN 3, SEMRA 2, Civil Defence 1. After the photos were taken, there was a final Q&A session where each attendee gave feedback regarding the day. The general consensus: more events like this, more situation exercises, more time spent at each session. Back in Clogheen Civil Defence treated us to a very tasty buffet which gave everyone an opportunity to chat about the days happenings. A team of amateurs is said to be operating from the epicentre of the earthquake, Wenchuan, using 40m, with nearby the Chengdu UHF repeater being used to direct ambulances. An article from the ARRL (American Radio Relay League) today details the harsh circumstance the earthquake survivors in the Wenchuan Area of China’s Sichuan province are having to live with. Chinese amateur radio operators are operating from the earthquake zone passing messages, directing emergency support amongst other essential jobs. The Chinese amateur radio organisation, the Chinese Radio Sports Association, has called on members “to take actions to ensure their amateur radio stations to operate properly, and to the extent possible stand by on often used short-wave frequencies”. At 1757 UTC on Monday, May 12 an on the ground report from Liu Hu, BG8AAS, of Chengdu a town in the province of Sichuan, reported that a local UHF repeater survived the disaster. “It keeps functioning from the first minute and more than 200 local radio hams are now on that repeater. A group of hams from Chengdu has headed for Wenchuan, the center of the quake, trying to set up emergency communication services there,” he said. Michael Chen, BD5RV/4, said that Yue Shu, BA8AB, also from Chengdu, Sichuan, was reported to be active on the 40 meter emergency frequency on Monday. “Up to now, there has been no further information available from the center zone of the quake. There are a few radio amateurs there, but all of the communications have been cut out, including Amateur Radio,” Chen said. Lets hope the survivors receive the help they need and they are able to rebuild their lives. Last Saturday the 12th of April, commencing at 10AM, AREN held a meeting in the Clonmel Park Hotel, on the outskirts of Clonmel, South Tipperary. There was a very satisfactory turnout, with members attending from Dublin, Waterford, Tipperary and as far away as Donegal, and West Cork. The guest speaker was Mr. Paul Gaskell, G4MWO, of RAYNET UK. The meeting began with an overview of what AREN actually is, and what it’s role within Amateur Radio is. This was very useful to give members a clear understanding of what is required of an AREN member. A run-through of the organisation internal structure was given and also the new committee was introduced to members, as well as new members introducing themselves to everyone. (Expressions of interest are welcomed – please contact us if interested). A lively discussion around AREN fundamentals, member competencies, technical, operational, and teamwork then took place. These were all important to build a sense of a common team goal, and technical expertise within the AREN organisation. An introduction to the concept of Net Control was also given. Net Control is responsible and manages such functions as activating and assigning Net resources, assigns tactical calls, keeping a good log, assures that traffic messages are moved quickly and efficiently. A discussion on the possible usage of the 5MHz radio spectrum also took place. This spectrum would be very beneficial in conditions when other radio spectrum was unusable. AREN‘s role in national emergencies was then discussed. It is hoped that AREN will be able to assist national voluntary and primary response agencies in an official capacity as part of a National Emergency Plan. After lunch John, EI7IG and Conor, EI4JN, organised a table-top exercise. This was to put the attendees in the Emergency Communications mind-set, and thinking about some of the problems that could potentially occur. After the exercise, a review of 2007 exercises, operational details and a financial report was discussed. John and Conor presented different go-kit set-ups. Essentially a radio go-kit is a small, portable, bag with all the necessary equipment to set-up an emergency radio communications station. “It is better to have the bare essentials always handy than to leave a bulky pack someplace where you can’t get to it”. Paul, G4MWO, of RAYNET, gave an interesting and useful talk about RAYNET operations in England, technical discussions RAYNET are involved with, and issues RAYNET have had to overcome when dealing with other voluntary, and non-voluntary response organisations in the UK. John, EI7IG then gave a technical report of the GAISS project, which was a collaboration between AREN, the TSSG research group in Waterford IT, and the South East Mountain Rescue Association. The meeting ended with an open discussion on various topics.